We have an updated event calendar chock full of fun new things we’re excited to roll out, but first I want to take a moment and thank the Geezers Gone Wild and Cowboy Gelato for making our “Rock for Relief” Hurricane Harvey fundraiser such a success! We were able to donate $1200 to the Austin Disaster Relief Network, which is expected to take in up to 6,000 evacuees from the gulf coast of Texas. We have been 100% Texas since we started, and that means more than just the grapes that go in the bottle. It means a pride for our home, love of our neighbors and willingness to dig in and do what it takes. So, a HUGE thank you goes out to everyone that made that fundraiser such a fun event and a wild success! Between the cover charge, extra donations and a couple auction items, we were blown away by the generosity of our friends in the Texas Panhandle! 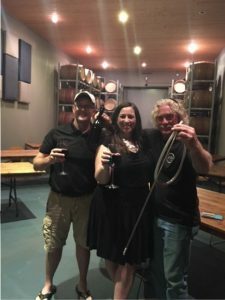 We are fermenting grapes, but you know we have to have some FUN!!! 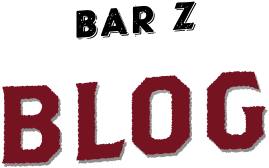 September is a great month to come out and find your new favorite wine! 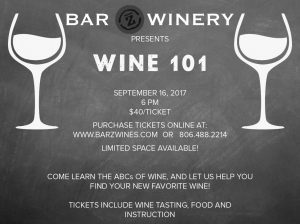 Join us to learn about tasting, pairing and selecting a wine! The only course where drinking is part of the curriculum! 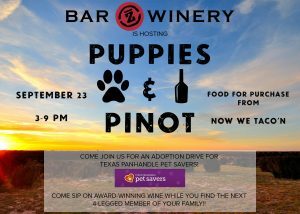 What could be better than award-winning wine and PUPPIES!? Oh, and there’s tacos….you won’t want to miss this opportunity to find the next four-legged member of your family! How does a relaxing evening sound? 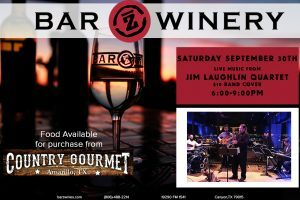 We’ve got a beautiful view of the sunset, sweet jazz from local musician Jim Laughlin and his band, and a glass of wine that we would be more than happy to refill for you!